School administrators said they had no record of Faulker ever attending the school. 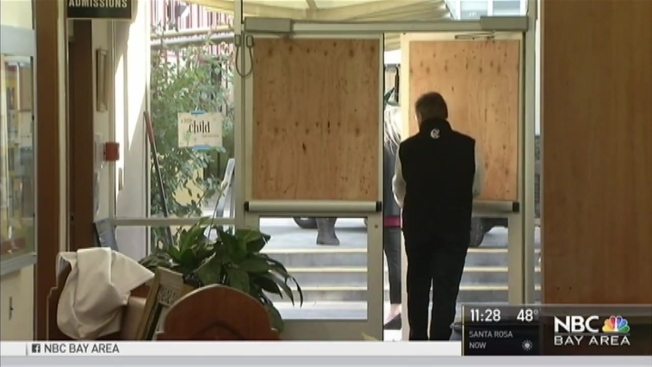 A 23-year-old Guerneville man has been arrested after a Catholic school in Santa Rosa was trashed – glass doors and windows were shattered in the administration office, two days before Christmas break. Andrew Faulkner was booked into Sonoma County Jail for burglary, felony vandalism and being under the influence of a controlled substance, according to Sheriff’s Lt. John Molinari. His bail was set at $125,000 and damage to the school was estimated at $100,000. Efforts to reach him were not immediately successful early Tuesday morning. And sheriff’s deputies did not disclose a motive for the vandalism. School administrators said they had no record of Faulker ever attending the school. "I feel very sad that someone would feel this way," Cardinal Newman High School President Laura Held said Wednesday morning outside of the school. She said she had no idea why someone would violate the school community and its traditions. She said that she thought he used fire extinguishers and planters to break glass, and that computers were pushed off the desks, and papers strewn around the floor. "I couldn't believe it," student Caroline Olsen said. Molinari said that firefighters were called out on Monday about 7 p.m. when an alarm went off at the school. Firefighters saw that the front glass doors at the school were smashed and there was severe damage inside the office, Molinari said. They also found a man inside throwing things and breaking glass windows, which is when they called the sheriff, Molinari said. Pictures taken at the scene show a small Christmas tree flung to the ground and broken glass everywhere. Deputies said they arrested Faulkner without incident. According to the school website, finals are scheduled for Tuesday, and Christmas break begins on Wednesday. Student Gavin Dove said that while he's hurt that someone would do this to his school, "as a community, we can learn from this and be stronger." NBC Bay Area's Shawn Murphy contributed to this report.